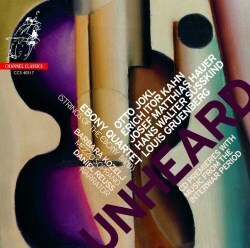 Unheard presents music by five composers that has not only never been recorded, but has not previously been performed. The works are linked by association with the twelve-tone movement, and are performed by the Ebony Quartet, four members of the Concertgebouw Orchestra who form the core of the much-recorded Ebony Band. My two favorites are the works by Josef Hauer and Louis Gruenberg, both of which exhibit a certain lightness and wit that brighten an otherwise solemn disc. Hauer invented his own twelve-tone system before Arnold Schönberg, whose fame he begrudged. How much did he resent Schönberg? Enough to stamp his works (and his correspondence) with the legend, “The spiritual father and (in spite of many imitators!) still the only master and connoisseur of twelve-tone music”. This eccentric composer was later abused by the Nazis and left to work in obscurity as a dodecaphonic gentile. His 1924 Five Pieces for Quartet are brief but appealing. The forceful rhythms of the odd-numbered movements are broken by the gentle flow of the even numbered ones. The music is highly chromatic, and is said to be inspired by ideas of the Dutch “De Stijl” painters, although this is not immediately obvious. Louis Gruenberg’s Four Indiscretions for String Quartet of 1925 may be indiscrete for its references to popular music. More than any of the other works on this disc, it sounds like the irreverent 1920s that we know from Gruenberg’s neoclassical counterparts (such as Hindemith, Schulhoff, Martinu and Stravinsky). Gruenberg, an American who worked in Europe for a spell, explores a range of emotions in his short quartet. The opening Allegro con spirito begins with a hoe-down like phrase, while a Lento provides the work with a few moments of calm. A whisp of a minuet is both tantalizing and elusive. The final Allegro giocoso is fun, moving quickly from a boisterous beginning to an ending that fades quickly to nothing in a brilliantly playful manner. Erich Kahn’s Fragment of an Unfinished String Quartet, from 1924 or earlier, is both unsettled and unsettling. This is expressionistic writing that reminds one of the Schönberg of Transfigured Night, but not quite so lush. One wishes there were more of this work than this substantial fragment. With the rise of the Nazis, the Jewish Kahn fled to Paris, where he instructed René Liebowitz, who in turn passed on twelve-tone composition to Pierre Boulez. Kahn, like the other Jewish composers on this disc, eventually made his way to safety in the United States. Otto Jokl’s second String Quartet is the longest piece on the disc. The opening Andantino begins in a confident stride, but the music subsequently moves between skittish and grim. I found it difficult to embrace, although not from any lack of commitment or skill by the Ebony Quartet. Other listeners may enjoy the work more than I. When the Germans took over Austria, Jokl attempted to protect himself by converting to Catholicism, with Anton Webern standing as his godfather. This quartet is from 1948, when Jokl found it expedient in his American exile to publish under the name ‘Anthony Garden.’ On the Ebony Band website, Werner Herbers describes the difficulty of extracting a copy of this work from the Bavarian State Library, which blocked performance on the grounds that there was no heir to tend to copyright matters. From a distance it looks like posthumous antisemitism, much like the problems in recovering paintings stolen from Jewish families from the walls of German museums. Happily, Herbers managed to track down a previously unknown relative, and the work was freed to be heard on this disc. Walter Susskind enjoyed a successful career conducting the Toronto and St. Louis symphony orchestras. His music here is something of a surprise. Not only did I not know that he was a composer, neither did I realize that he had been such a red in his younger days. Two works are offered, one a group of four songs to poems by Wilhelm Emanuel Süskind. Soprano Barbara Kozelj seems almost a fifth member of the quartet in her warm contributions to this melancholy music. The other work, “Accountability for us” is for quartet and narrator. Noted choral conductor Daniel Reuss speaks his way dramatically through ten rebellious texts by the communist poet Louis Fürnberg. The work has cabaret-like moments, but is not very interesting musically. The presence of a narrator often means that the music will take second place to the words, which can be more emphatically didactic than notes. This is the case here. Texts are provided, but only in German. The Ebony Quartet performs this intense music with passion and precision. Channel Classics matches them with a recording characterized by warmth and clarity.